The mission of Family Promise of Hawai'i is to mobilize existing community resources to aid families with children experiencing homelessness and help them transition to sustainable independence. Family Promise of Hawai'i is an innovative community based program designed to help homeleless families with children transition to sustainable independence. 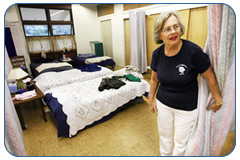 We partner with two interfaith hospitality networks consisting of over 65 congregations on O'ahu. Each network hosts families a week at a time four times a year. Together they shelter up to 28 people and 10 families each week, 7 days a week, 365 days a year. Our Wait List Program provides a safe place for an additional six families at a time so they may bathe, do laundry, care for their children access phone, computers and mail, maintain or search for jobs and apply for housing. Our program operates at one-third the cost of traditional shelter programs. Families with children, the fastest growing segment of our homeless population. Adult family members who are willing to work, attend school, actively seek employment or enter job training. Families who are highly motivated to make positive changes in their lives. Families who have the flexibility to move and adapt to a new host site each week. Offer a warm and welcoming environment at the congregations and Family Centers. Engage and train over 1,500 volunteers to provide hospitality, good meals, help with homework and mentoring for families. Assess each family's needs with professional staff and create a case plan with goals that are reviewed at weekly meetings. Help families save money for rent and learn how to budget. Connect participants with job training and employment opportunities. Provide twice daily transportation between the Family Centers and the host congregation to enable families to work and attend school. Collaborate with local social service organizations to provide guests with needed resources. Follow up after placement to ensure our families remain successfully housed. Build a support system for a more productive future. Since opening in March, 2006, Family Promise of Hawai'i has assisted hundreds of families Family Promise of Hawai'i programs and services continue to grow to meet the needs of our homeless populations. Over 80% of our guests transition out of homelessness to housing usually within 3-4 months. Nearly 100% of our families secure, maintain or improve employment. Families save an average of $1,200 to dedicate to housing and pay down debt. Families receive referrals to health services. Children enroll in early education. We collaborate with community partners to provide comprehensive life skills training such as money management, nutrition and parenting. We utilize donated community resources for food and shelter valued at over $650,000 per year. Our volunteers report great satisfaction from serving local families in need and share their enthusiasm about the success of the program with others.